Ticks -- the eight-legged bloodsuckers that most of us avoid -- are fascinating to Assistant Professor of Biology Andrea Swei. She studies how ticks interact with the lizards, birds and mammals they feed on and looks at how those relationships affect the risk of humans contracting tick-borne diseases. 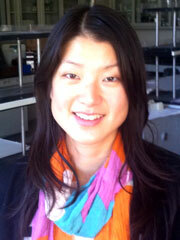 Andrea Swei, assistant professor of biology. "Sometimes in nature there is a cascade of ecological events that impacts disease risk," Swei said. "Climate change, habitat change and shifts in the number of species in a particular community can all have implications that directly affect human health." Swei, who joined the SF State faculty in January, has spent much of her career studying the ecology of Lyme disease, a flu-like illness that can turn into a chronic condition. Her research has overturned long-held theories on the link between California's lizard population and Lyme disease risk, and she has published findings on how the tree fungus, Sudden Oak Death, may lead to an increase in tick populations. Lyme disease is not the only illness ticks carry. In the last few years, new diseases have emerged, including the Heartland virus, which has infected two farmers in Missouri, and Southern Tick Associated Rash Illness, a "Lyme-like illness" that occurs in the Southern U.S.
With these emerging diseases in mind, Swei turned her attention to a mystery virus called the Lone Star Virus, named after its host, the Lone Star Tick. Swei and collaborators at University of California, San Francisco and the Centers for Disease Control sequenced the genome of the virus and recently published their results in the journal PLOS ONE. "The Lone Star Virus was first discovered in the 1960s but since then it's been sitting in the vaults at the Centers for Disease Control. Until now, no one had analyzed it," Swei said. "Now we know what kind of virus it is. What's interesting is that it is closely related to several other viruses that cause disease among humans." The study did not confirm that the Lone Star Virus causes disease in humans, but "it's a distinct possibility that it does," Swei said. Lab experiments conducted as part of the study found that the virus is able to kill human-derived and monkey-derived cells. Armed with the virus' entire genetic code, scientists will now be able to develop tests to assess how prevalent the virus is among ticks and track whether it is showing up in humans. Now that Swei's lab is up and running at SF State, her next step is to explore the miniature ecosystem of viruses, bacteria and other single-celled organisms that co-exist inside the body of each tiny tick. It is important work, she says, since tick populations -- and the diseases they spread -- are on the rise in the United States. Scientists believe that milder winters in northern regions, caused by climate change, are allowing ticks to extend their habitat range. "I've always been a big picture person," Swei said. "What drew me to this field is that I get to conduct ecological research that is relevant to people and has implications for public health policy makers." When she's not in the lab analyzing the genetics of tick-borne viruses, Swei is in the field studying the dynamics of the communities that ticks inhabit. "There's a lot of noosing lizards, trapping rodents, counting ticks, dragging leaf litter and surveying the composition of trees," said Swei, who will conduct fieldwork in Mendocino County this summer. She is also preparing to teach a new class this fall on the ecology of infectious diseases, in which students will learn how to use computer programming and lab techniques to predict disease outbreaks.